It’s hard not to be happy and have a smile on your face when you are riding a bike in Vancouver. What a wonderful weekend for riding it was. It’s really starting to feels like summer now that the sun is getting hotter. The smell of sun block is in the air and the pools are open. Folks involved in “active transportation”: walking, using transit and riding bikes have more reasons to have a smile on their face. 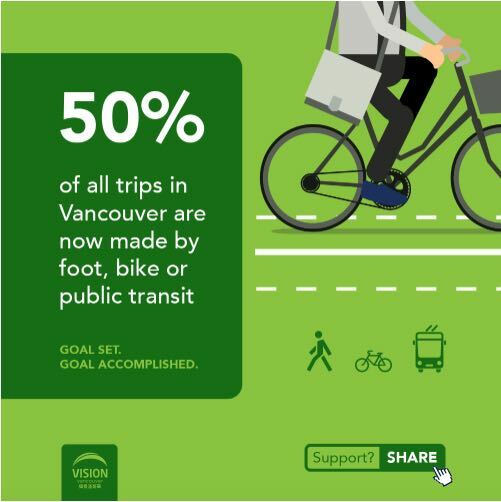 Last week at city council it was reported that 50% of all trips in Vancouver are done by active transportation. This was a goal in the Greenest City Action Plan for 2020 and in 2016 we have already accomplished this goal. This is up from 40% in 2008. Nicely done Vancouver! In a email from Vision Vancouver last week it was stated “…there are now almost 100,000 bike trips a day in Vancouver. That’s a 20% year-over-year increase.”, which is pretty remarkable. Active transportation is definitely better now that there are protected bike lanes throughout the city, like the Burrard Bridge, Hornby Street, the Adanac-Union Bikeway and the Pt. Grey Road greenway. But we still need to do more and support city council in creating safety improvements to make walking and riding bikes better. There are still lots of gaps in the bike network in Vancouver. Every time I ride through the West End to the Burrard Bridge I know we can make this route safer and better. Please sign the petition to create more bike lanes in Vancouver. Tagged with: AAA cycling, Biking, Vancouver, Vision Vancouver.